It seems virtually accepted common knowledge that Americans over spend and that this is a major cause of our current financial problems. The key measure of over spending is whether or not you spend more than you have available available to spend. We can measure that by figuring what percent our consumer spending represents of our disposable income. The US Census bureau has historical information on personal income and expenses in the 2009 statistical abstract. The specific item I looked at was ''Selected Per Capita Income and Product Measures in Current and Real (2000) Dollars''. The Excel sheet has data back to 1929. I only looked at the unadjusted figures and then I calculated the basic percentage that consumer spending was of disposable income. In 1933 the spending hit 100%. That was a result of the great depression and the decrease in personal income at the time. 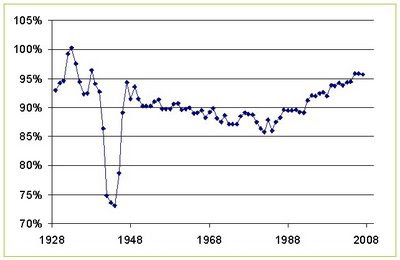 As you can see there was a big dip in the 1941-1945 period where our consumer spending dropped significantly. This is obviously due to WWII. That drop was temporary and you can see that consumer spending returned to pre war levels within a couple years after the war end. Then past WWII from the 1950's to mid 1980's our consumer spending dropped gradually. In 1947 consumer spending was 94% of disposable income. By 1984 the rate had dropped to 86%. In that same period our per capita income was steadily increasing. From 1947 to 1984 personal disposable income increased at a compound annual rate of +6.5%. From the mid 1980's until we've been spending higher rate of our disposable income. In 1984 our spending rate was 86% but by 2007 it had jumped up to 96%. During that same time our income has grown at a slower rate. From 1985 to 2007 the compound annual growth rate of per capita income was +4.4%.